When you have arthritis in your hands, it is sometimes hard to open the other containers - but- these are a dream come true. They have an excellent seal and can be opened without causing pain to my hands. The fact that they can be nested, makes storage so easy. I love these containers. The snap tops are great! Stackable in cabinets to save space. I would buy again. I store my fruit for Amish Friendship cakes in them after I finish preparing them. Like how they nest in each other. Most boxes don't snap very easy. Got this for a Christmas Gift. Kinda disappointed in them. I thought they were a little bigger. Guess I read it wrong. I wouldn't buy them again because they wouldn't work for me. I will see if my Daughter (whom I got them for) likes them or not at Christmas time. Set looked bigger and sturdier in picture but this is very very very small set and biggest item was cracked on arrival plastic is thin and stiff but tops look good Didn't return due to shipping was more than the item price. The lids do not seal well & most times I cannot press the locks down on all sides, especially the 2 largest ones. I do not think these are quality containers at all. 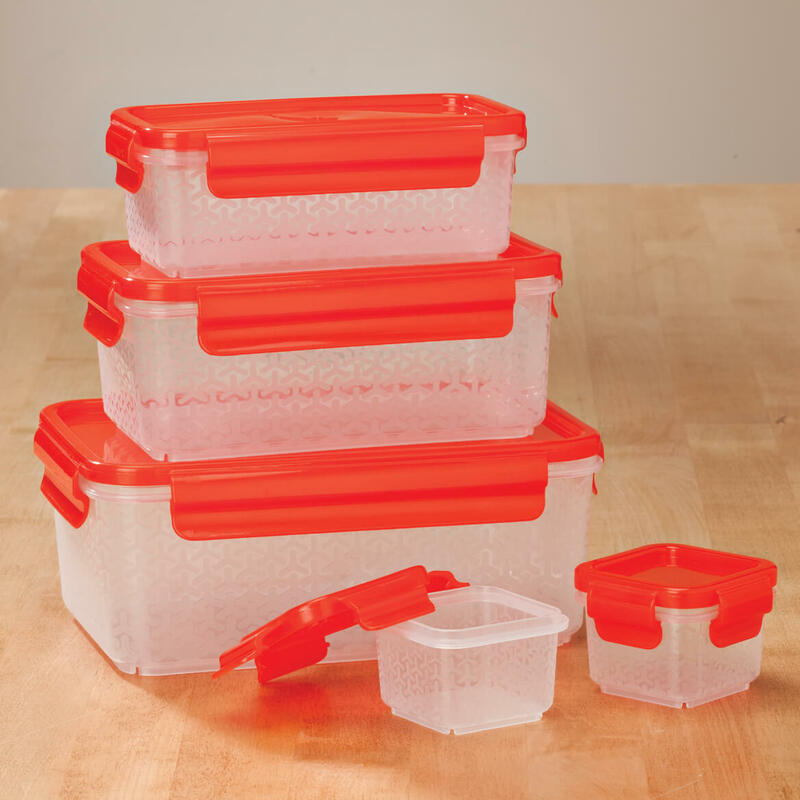 I need more food containers; love the sizes and the way the lids fit. good price on containers that I always can use. Like the way they seal. The Nested Food Containers, caught my eye though I have not used this brand name, yet. I like the fact they are the size I need to store extra bulky food items in my freezer without taking too much space. I like the bright color lids and the fact that you can see through the containers without removing the lids is a plus. I feel the locking feature on food containers make them more secure, especially if accidentally dropped. because I use a lot of food storage containers. have had experience with this type of container, they work great! Great price! This would make my food look nice and neat in my refrigerator. Durable and the price is amazing! I thought the idea of nesting would cut down on my use of storage space. Hope so. Look's like what I need and the price is right . What are the sizes of the set? BEST ANSWER: Thank you for your question. It comes with two 3-oz. 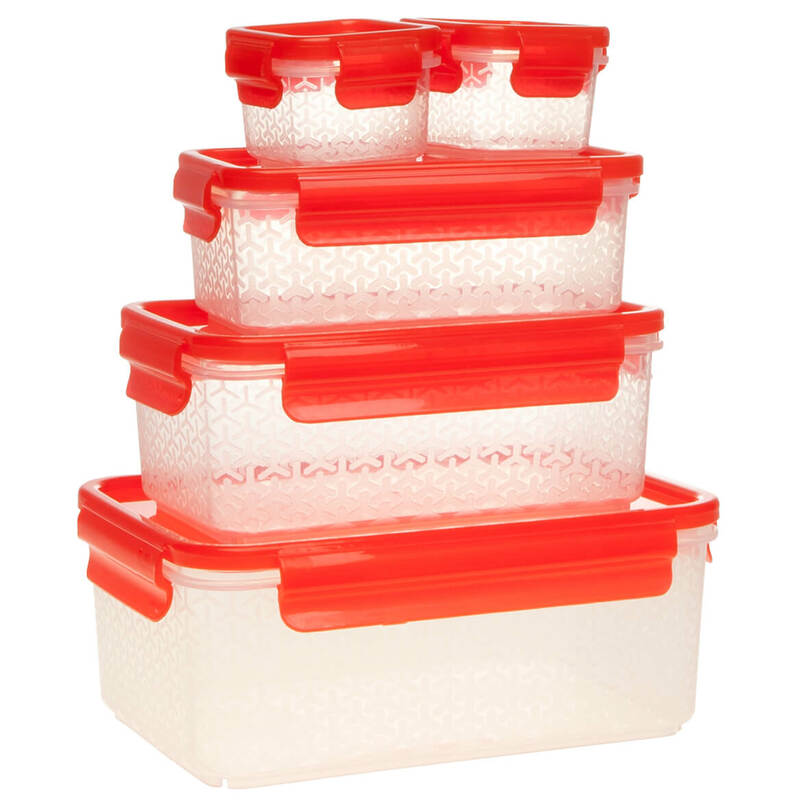 containers with lids (2 1/2" x 2 1/2" x 1 3/4" high), one 13.5 oz. container with lid (6" long x 3 1/2" wide x 2 1/4" high), one 27-oz. container with lid (7" long x 4 1/2" wide x 2 1/2" high) and one 54-oz. container with lid (8 1/4" long x 5 1/2" wide x 3 1/16" high). We hope this information will be of help to you. Are they microwave safe are they plastic or glass? BEST ANSWER: Thank you for your question. They are made of plastic and are safe for microwave and dishwasher. We hope this information will be of help to you.